In researching about the different types of dolls, I was amazed at the wide variety of dolls that have been manufactured and sold through time. This article mentioned a lot of doll types by era, by material, by function and by type. But for the sake of simplicity, I would just like to feature play dolls -- the dolls that little girls want to play with. These are fashion dolls, baby dolls, and cloth dolls. Wikipedia defines fashion dolls as dolls designed to be dressed to reflect fashion trends. The most popular of these types of dolls are Barbie dolls, but there are many other choices in the market. There are Bratz dolls, Monster High dolls and Disney character dolls like from the movie Frozen or Cinderella. Little girls are so familiar with the characters that these dolls portray because of watching them in the movies or on TV. Sometimes, they play with them as if acting out the roles they have in the film. You will be fascinated with their imagination. What they like most about these dolls is being able to change their clothes, mix and match their outfits. Many sets of doll clothes can be purchased separately so that the little girls can have more fun play. My little girls even take time to comb and fix their hair in different styles. It's good to have hair accessories, bags and shoes for these fashion dolls as well to triple the fun. Click to find the popular fashion dolls on Amazon. 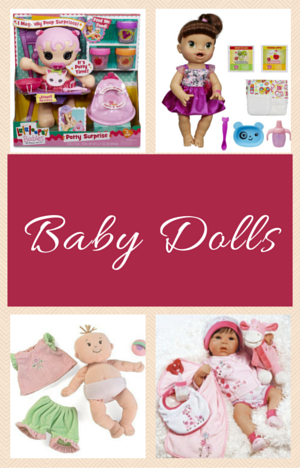 Baby dolls are a favorite among toddlers and most 3 years and older girls love playing with this type of doll. Baby dolls can give the child a chance to play pretend that she is "mommy taking care of her little baby." I remember my daughters when they were still little. They love playing with the baby twin dolls they received as gifts for Christmas. Since I breastfed them, I even saw them pretending that they were breastfeeding the baby dolls. I can't keep myself from giggling. There are lots of choices when it comes to baby dolls. You can find a baby doll that cries, talks, drinks milk, sleeps, pees or poops. Your child will have fun feeding the baby with milk or baby food. She can change the baby's clothes and diaper. She can sing the baby to sleep or play with the baby and hear her laugh or cry. It's like having a realistic experience of nurturing a baby. Check out the different offers on Baby Dolls at Amazon. Rag dolls are soft dolls that are made from cloth. I remember when I was little, the most popular were the Cabbage Patch dolls. Today, when little girls go to the toy store, they will find more of these cloth dolls from brands including Raggedy Ann, Strawberry Shortcake, Madeline, Mooshka, Madame Alexander and even Disney Princess. Of the tree types of toys mentioned in this article, cloth dolls are the huggable ones. They can be a child's sleeping companion. Well, not just for the young ones because even the big girls love to hug "someone," too. Doll sizes vary from 8 inches to as big as 25 inches, so there's a size that fits a small or big girl's hug. 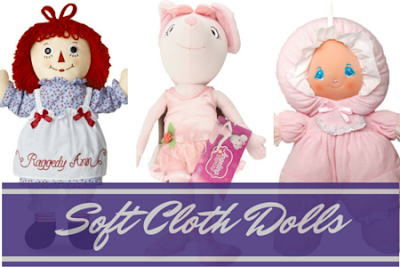 Moms can also wash these cloth dolls, so they can be kept clean and safe even for babies. Many are made of pure fabric, without plastic or anything hard making them perfect for babies 0 to 18-months old. Examples are Angelina Ballerina and Darling Soft Rag doll. Girls have different likes and dislikes when it comes to dolls and toys, so if thinking of buying them a doll as a gift, better see what they like. Do they have a favorite character they watch on TV? Most likely there's a doll of their favorite characters in the store. Fashion dolls for 6 years to 10-year-old girls. This is just my personal opinion as I look at how my 3 girls change their preference for dolls as they grow up.